In response to the increasing usurpation of the Salzburg Festival and the Bayreuth Wagner Festival by the National Socialists, none other than Arturo Toscanini advocated in 1938 the establishment of a quasi-anti-fascist orchestral festival in Switzerland. Already at that time the Lucerne Festival Orchestra was not an established but an ad hoc ensemble made up of top musicians of Europe, which was welded together to a top orchestra by the outstanding orchestra teacher Arturo Toscanini in an incredibly short time. 1943 the original concept of an internationally mixed festival orchestra was shelved for fifty years in favor of an orchestra composed entirely of Swiss musicians. In the nineties, the idea of an international orchestra was taken up again and in 2003, Claudio Abbado presented such Lucerne Festival Orchestra to the enthusiastic Festival audiences. Regarding the selection of musicians, who were then recruited in addition to well-known soloists and orchestral first chair players, especially from the Gustav Mahler Youth Orchestra and the European Community Youth Orchestra, and in formation of the orchestra Abbado followed in the footsteps of Toscanini. 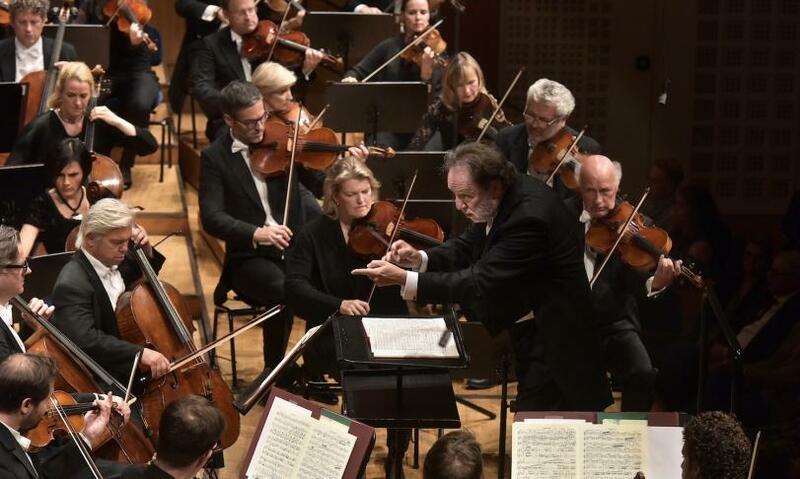 Andras Nelsons followed on Abbado and since summer 2015 Riccardo Chailly, principal music director of La Scala Milan, has taken on the role of determining the composition of the Lucerne Festival Orchestra and of conducting annual concerts in Lucerne and then on guest tours. It is interesting that despite the changing international structure and temporary activity since the first concert under Abbado fifteen years ago, this orchestra cultivates a consistent ideal of sound that distinguishes it from any other top orchestra in Europe: This orchestra cultivates an incredibly luxurious sound up to the extreme fortissimo, accessible to the bright as well as the dark, with velvety strings and wind instruments playing always civilized and rounded-up. The new Stravinsky album also benefits from this sound, which features a special ten-minute orchestral piece "Chant Funèbre", a mourning song about the death of Nikolai Rimsky-Korsakov, mentor and composition professor of Igor Stravinsky. A special feature of this Wagner-like darkened piece, reminiscent in its colorfulness of Rimski-Korsakov's colorful art of instrumentation, is that it was considered lost for more than a hundred years, rediscovered by chance at the St Petersburg Conservatory in 2015, played here sounding reasonably sumptuous and perfect, and recorded for first time. A trouvaille of the Russian master, whose late rediscovery is worthwhile hearing, if only because it closes a gap in the compositional development of Stravinsky. Drei kurze wohlbekannte, unmittelbar vor dem frühen „Chant Funèbre“ geschaffene, hier exquisit zum Klingen gebrachte Stücke „Feu d’artifice“, „Scherzo fantastique“ und „ Le Faune et la Bergère“ tuen kund, dass Riccardo Chailly den frühen Strawinski neben dem „Le Sacre du Printemps“, das bei der Uraufführung in Paris unglaubliche Tumulte auslöste, heute jedoch vom Konzertpublikum trotz zum Teil roher Wildheit nahezu kulinarisch genossen wird, zu schätzen weiß. Die klangliche Opulenz des Lucerne Festival Orchestra und die Detailverliebheit Chaillys, der im Vergleich zu deutlich wilder konzipierten Interpretationen von beispielsweise einem Pierre Monteux (Aufnahme 1956) oder einem Georg Solti eher gemessen ans Werk geht, kommt der Genießbarkeit des „Sacre“ zugute. Dem kulinarischen Genuss gibt man sich allerdings gerne hin, wenn er dermaßen perfekt serviert wird wie vom Lucerne Festival Orchestra unter Riccardo Chailly anlässlich dieser Liveaufnahme vom August 2017. 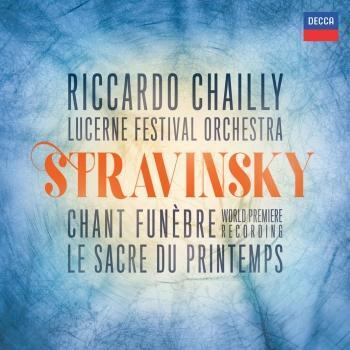 Three short well-known pieces, "Feu d'artifice", "Scherzo fantastique" and "Le Faune et la Bergère", created immediately before the early "Chant Funèbre", announce that Riccardo Chailly appreciates the early Stravinsky alongside "Le Sacre du Printemps", which caused unbelievable turmoil at the premiere in Paris, but which today is enjoyed nearly culinarily by the concert audience, despite partially raw wildness. The tonal opulence of the Lucerne Festival Orchestra and Chaillys love of detail, which compared to much more wildly conceived interpretations of, for example, by a Pierre Monteux (1956 recording) or by a Georg Solti, promote the enjoyableness of the "Sacre". However, the culinary enjoyment is welcome, if served so perfectly as by the Lucerne Festival Orchestra under Riccardo Chailly on the occasion of this live recording from August 2017.